Ansbach is one of the few locations in Germany designated an enduring location once current transition plans have been completed. This 1,200-year-old capital city of Franconia, is steeped in history. It's mentioned in records dating from before the rule of Charlemagne. Ansbach was damaged in World War II but was saved from total destruction. Completely restored, it still retains its medieval character. 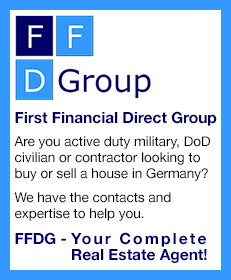 USAG Ansbach provides base support services to military personnel and their families in the Ansbach, Katterbach, and Illesheim communities. Storck Barracks in Illesheim, though somewhat small and isolated, has every life-sustaining facility necessary; commissary, shoppette, bookstore, education center, clubs and tremendous recreational outlets. Recreational outlets include three area golf courses that cater to military duffers, fishing, hunting, swimming, bowling, biking, and more Volksmarches and running trails than one can imagine. The sports program offers a full slate of team sport activity. And there are two complete, physical fitness centers that are undergoing renovations. Outdoor Recreation offers economical ski trips and packages to ski resorts in Austria, Italy, Switzerland, France and the Edelweiss Lodge and Resort in southern Bavaria. The United States Army health clinics at Katterbach and Illesheim are outpatient facilities providing high quality primary and limited specialty health care. 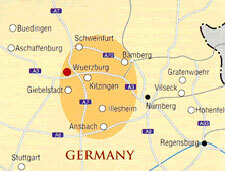 Serious cases are referred to local host nation hospitals or the Landstuhl Regional Medical Center. The dental clinics at Katterbach and Illesheim provide general dentistry and specialty treatment to authorized individuals. Veterinary Services include animal disease prevention and control, issuance of health certificates and vaccinations. Department of Defense Dependent Schools also serve the garrison with two elementary schools and a middle/high school in Ansbach, and an elementary/middle school in the housing area at Illesheim. High school students in Illesheim are bused to Ansbach. The Army Community Service (ACS) center offers various programs and services for soldiers, civilians and family members; parent education classes, financial maintenance classes, relocation information and support, mobilization and deployment support, employment services, Army Emergency Relief (AER) and volunteer programs. Child Development Services provides full service, center-based childcare, the Family Child Care (FCC) program, the School Age Services (SAS) program and respite childcare for service members in pay grade E-4 and below. Youth Services operates a sports and fitness program for organized seasonal sports. Volunteers are an integral part of every community. Volunteer experience offers great potential for self-fulfillment and may also be reflected on resumes for future job employment. The Chapels at Katterbach and Illesheim offer services and religious education in numerous denominations. Your Chapel staff can provide information about them. There is a wide range of Bible study groups, classes and retreats offered by the program. The Army and Air Force Exchange Service (AAFES) facilities at Bismarck Kaserne in Ansbach include a retail store, service station, shoppettes, pick-up point, military clothing sales, video store, Class Six beverage shop, laundromat, movie theater and barber and beauty shops. The commissary at Katterbach Kaserne sells U.S. brand-name products and many European specialties. 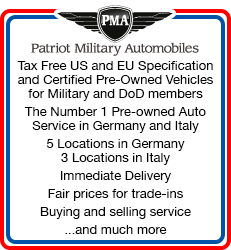 There is an exchange, shoppette and commissary also at Illesheim, and franchised restaurants such as Subway at Storck Barracks and Burger King at Katterbach. The Terrace Playhouse presents four "main stage" productions a year, plus "extras" such as concerts and talent contests. The entertainment branch offers an outlet for the talents of actors/actresses and technicians. The Libraries in Ansbach and Illesheim have fiction and nonfiction book selections, reference materials, travel guides, videos, educational resources, children's books, magazines and computers with internet access. The Franconian Inn transient lodging facility offers affordable and comfortable alternatives to local hotels and pensions. The Community Bank offers full service banking. Automatic teller machines (ATMs) offer 24-hour service for deposits and withdrawals from both checking and savings accounts. The Auto Craft Shops offer assistance in performing automotive maintenance and repair. Equipment, tools and trained mechanics make everything, from charging a battery to major overhauls, possible at great cost savings. Much of AFN's TV and audio broadcasting is the same command-wide. However, it also breaks away throughout the day so that viewers and listeners can learn what's going on in their local area.